Candida Albicans : Could Yeast Be Your Problem? 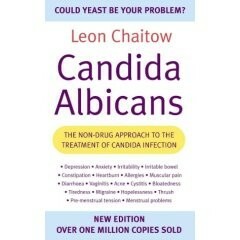 Book Store & Reviews Environmental Illness Books Candida & Gut Dysbiosis Candida Albicans : Could Yeast Be Your Problem? by Leon Chaitow, D.O., N.D. This best-selling book (over one million sold) shows how to detect whether yeast is your problem and provides a comprehensive non-drug approach to the treatment of Candida, providing help and advice for sufferers of conditions such as IBS, cystitis, thrush, PMT, fatigue, muscular pain, allergies and many more in which yeast overgrowth may be playing an active part. This best-selling book from leading naturopathic doctor Leon Chaitow is now in it's 5th edition. Regular updates since first publication over 10 years ago mean this book contains all the latest information on illnesses related to the common yeast Candida Albicans. Dr. Chaitow writes in a very engaging style and provides a wealth of information on how Candida Albicans can cause disease and is connected to a host of conditions such as fatigue, PMT, thrush, and allergies. Being a licensed naturopathic physician, the author backs up each of his claims with research evidence without confusing the average reader. The book contains information on drug-free treatment options for overcoming illness resulting from imbalances of Candida Albicans in the body. This section is not as extensive as it could be but will still be very helpful to most. Although this book is not the most comprehensive on the subject it is a very good introduction from a well educated and knowledgeable author. Best-selling book from a leading naturopathic Dr.